In fact, international law does provide an achievable solution to the China-Japan dispute. A year ago, China established a very large Air Defense Interception Zone (ADIZ) in the East China Sea to fortify its territorial claims in the vicinity of the Senkaku/Diaoyu Islands. The United States signaled its serious concern with the action by operationally protesting the claim with the dispatch of B-52 bombers through the zone in late November 2013. On January 30, 2013, Japanese authorities reported that a Chinese frigate locked its fire control radar on a Japanese destroyer. In March 2014, a very senior Chinese security official said that the Chinese Army will not stir up war but will “fight back” at any provocation. The author wrote extensively a year ago that an equitable and face-saving solution was possible if both countries moderated their claims in accordance with general international law and the 1982 UN Law of the Sea Convention (UNCLOS). That proposal was labeled as interesting, but it never seems to have been taken seriously by policymakers on either side of the dispute. All the while, policy officials and academics from the Japanese and Chinese camps have focused on the question of whose title is better, who would win if there were war, or why no solution is politically possible because of the irreconcilable positions. Others wrote about the urgent need for maritime confidence building measures (CBMs) along the lines of the US-Russia INCSEA model to prevent an incident at sea among the two contestants. There are understandable fears that a military incident could escalate into a full-fledged battle between Asia’s two military and economic heavyweights. On the margins of the APEC Summit in November 2014, Presidents Xi Jinping and Abe finally cobbled together some dialogue and a vague agreement to establish a hotline and a maritime communication mechanism. The agreement, laced with non-binding diplo-babble, is probably the best that Beijing and Tokyo could muster given the sour state of affairs. CBMs are well and good but they are no substitute for a thoughtful strategy to solve the problem. In this particular case, the policymakers in both countries need not be creative since the long-term solution to this incendiary problem is for both countries to strictly conform their maritime claims and boundaries to UNCLOS and international law. Most U.S. military strategists agree on the potential seriousness of the dispute over the Senkaku/Diaoyu Islands, since a military conflict could involve the U.S. in a costly shooting war with a modern armed force. The islands themselves are tiny uninhabited scraps of land that both countries now claim as sovereign territory. According to a declassified CIA report these islets were “uninhabited and unimportant” until a 1969 Japanese survey found evidence of plant bearing sedimentary rocks in the nearby waters; suggesting the presence of oil/gas in the seabed near the islands. The leaders of both countries play to their domestic audiences and describe these barren rocks as “inherently part of Japan” (MOFA 2014) or “sacred” ground. (Beijing 1970) The truth is anything but that. These barren rocks have been uninhabited for the better part of the 70 years. The U.S. DOD thought so highly of them that they used them as an aerial target range following World War II. 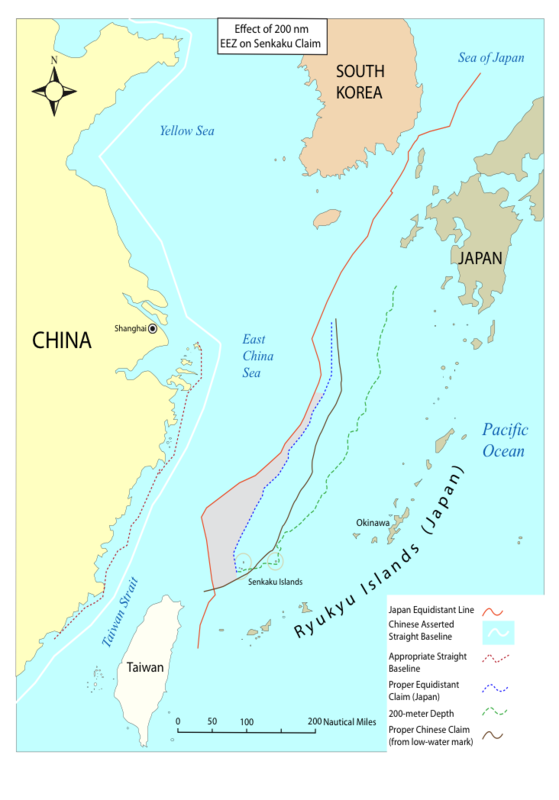 However, these rocks lie roughly equidistant from the coastlines of mainland China and Japan’s Ryukyu island chain, and ownership can thus play a major role in how the ocean boundary line between the China and Japan is drawn. Moreover, he who gets control of the rocks conceivably gets to control an additional 2,000 square miles of ocean territory and the oil and fisheries therein (shaded area in the figure). This problem is not unique: Shortly after passage of the 1982 UN Convention on the Law of the (UNCLOS) other states began to rediscover long-lost island territories to assert their rights to 200 nautical mile zones around their offshore rocks and islands so as to encompass the fisheries and hydrocarbon resources. That’s why the South China Sea, for example, is a tinderbox. The land is meaningless; it’s the associated waters that count. The United States has issued high-level statements that recognize Japan’s administrative control over the Senkaku, even though the text of the 1960 U.S. and Japan Self Defense Treaty does not frontally address a situation in which Japan might use offensive military force to expel non-military Chinese squatters on the island. Still, all U.S. policy officials would agree that Japan has the right to use force to protect its sovereign interests in the island. The United States would almost certainly provide military support to Japan if China ever attacked Japanese forces at sea or the Japanese mainland – irrespective of how those attacks were precipitated. Game theorists can have a lot of fun trying to predict who would win such a military exchange. In the author’s view, there would be no winners; particularly if the United States were drafted into the conflict because its Treaty obligations. This particular scenario is especially unsettling because if Japan were put into a position in which it had to use military force to teach China a lesson, it is the author’s assessment that Japan would perceive that they would get “one bite of the apple” and would launch massive attacks against Chinese military and “white hull” vessels. The asymmetrical economic and military differences between Japan and China are reminiscent of the situation facing Israel in 1967 when it launched a massive preemptive six-day attack against Egypt, Jordan and Syria because it knew it had neither the manpower nor the political or economic resources to enter into a war of attrition with its larger and more powerful neighbors. Japan may make the same calculation. The consequences for the U.S. of any type of military exchange would be horrible; especially if the U.S. had to become an active participant. The U.S. is now bogged down in the Middle East in costly military operations and having to become involved in a major naval engagement in the Pacific and in policing the disengagement would entail staggering costs. If merchant shipping came under fire, the costs to the world economy in the form of higher maritime insurance and transport costs would be significant. Last but certainly not least, there would be significant diplomatic and political costs if war in the East China Sea uncorked the festering disputes between Vietnam, China, and the Philippines in the South China Sea. Southeast Asian nations are anything but sanguine with China’s aggressive behavior in the South China Sea to assert its illegal 9 dashed line claim, build outposts on submerged coral reefs, and blockade the Philippines from coastal oil and gas and fishing grounds. Given this deep-seated resentment, it is not hard to envision conflict spilling over to the South China Sea, particularly since some states believe the U.S. will be their guarantor. More CBMs are not the answer. The solution lies in Japan and China brokering a deal that essentially takes the Senkaku off the table in terms of the effect that those islands have in establishing a maritime boundary in the East China Sea. Given the recent decisions by the International Court of Justice (ICJ) in the Serpent Island Case and the Int’l Tribual of the Law of the Sea in the Bay of Bengal Case to not allow minor “islands” to distort the continental shelf projections of continental states (including Japan) it is quite likely that a court would regard the uninhabited Senkaku as only “rocks” and give them a 12NM zone. This would result in a small blob around the island that is enclaved in the continental shelf/EEZ of either Japan or China rather than the full maritime zone. For this to work, though, Japan would need to concede that, in fact, the Senkaku are rocks versus islands and relinquish their claim to the shaded projection shown in the figure. To “compensate” Japan for this concession, China would agree to pull back its excessive straight baselines on its coast to only those permissible by UNCLOS. The white line in the figure shows China’s current baselines. The red dashed line is where they should be. Japan has publicly said that it is happy to go to the ICJ in order to litigate the question of sovereignty. Presumably, the court would also decide whether the features are a rock or an island. Japan has good reasons to be confident in the outcome because Japan is the only country to have occupied the island(s) in the past hundred years and the features have been more or less part of Okinawa Prefecture since 1895. 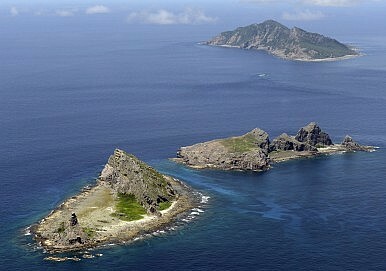 Also, the U.S. declared in 1972 and reaffirmed recently that Japan is the rightful administrator of the Senkaku. So, if Japan were to concede to China that the Senkaku are only rocks and agree to shelve the question of ultimate sovereignty, it eliminates its risk of facing defeat in the courts. Much more important: If Japan were to concede that the features are only a rock, it would free up over 2,000 square nautical miles in sea space that could be parsed by the two countries when they delimit their opposing EEZ/Continental Shelf claims. That sea space has significant economic potential for China: an importer of energy and protein. Meanwhile, if China were to either acquiesce in continued Japanese administrative control of the island or agree to shelve of the sovereignty issue altogether, Abe would be able to claim victory with his nation’s ultra-nationalists. On the economic front, getting China to walk back its excessive straight baselines opens up significant sea space that would go into the “pot” that the two countries could divide and exploit as part of their opposing continental shelves/EEZs. Even though this territorial exchange is not exact and Japan may give more by conceding that the Senkaku are rocks, the benefits far outweigh the negatives of being able to have good title to a large continental shelf areas in the East China Sea. The Blue Line represents the new boundary that would be established between Japan and China’s maritime frontiers. Since the median line between the two countries would be drawn independent of the zone around the Senkaku it frankly doesn’t matter much how the islands are classified: a no-man’s land or under the administrative control of one party. But if the parties were smart and wanted to completely put this issue into their national rearview mirrors, they would agree that the island would enjoy NO maritime zone – save for a 500 meter safety zone in the immediate vicinity of the rocks. This devaluation would open up sea space that both countries could divide and lower tensions associated with whichever side perceived that it was shortchanged on the sovereignty issue. Since both China and Japan are both parties to the Spitsbergen Treaty of 1920, which regulates the Svalbard Islands in the Barents Sea, they should have no difficulty in accepting an agreement that mimics that model. Given that Japan very likely has the superior claim to sovereignty and is relinquishing a greater amount of sea space by conceding that the Senkaku are rocks versus islands, it would be fair for China to agree that Japan would remain the administrator of the Senkaku. In exchange for that concession, both would mutually agree that China would have an equal right to any of the mineral and living resources on both the islands and the associated waters – either the 12 nautical mile or 500 meter safety zone. Some might criticize this plan because of the iconic value of owning the rocks. Yet apart from the private Japanese owners of the rocks, there is scant evidence that these rocks have iconic value to anyone in Japan or China except for the firebrands and politicians that talk up their value. Use of the administrative control moniker and giving each country access to the minerals and waters should calm those criticisms. India, Bangladesh, and Myanmar have just completed lengthy legal processes in the Bay of Bengal to establish their maritime boundaries. Uninformed journalists characterized Bangladesh as the big winner of its case against Myanmar because it received more territory than analysts thought it would get. However, in the two years since that decision was reached, the entire coastline of Myanmar has been successfully put up for oil and gas auction; netting Myanmar much needed foreign capital. If Myanmar is unhappy with the outcome, it certainly isn’t saying so. In both of these cases, the countries put their trust in the law and the outcome was highly successful for all concerned. This case is no different. All China and Japan need do is strictly conform their behavior to international law (including the recent cases involving minor islands) and both will quickly come to the realization that an UNCLOS-based solution to the East China Sea is easy to negotiate and explain to their public. More important, the solution will be internationally respected and stand the test of time. Mark E. Rosen, JD, LLM is Executive Legal Advisor at CNA Corp and is associated with the Hoover Institute’s Arctic Security Initiative at Stanford University. The views expressed in this paper are those of the author alone and do not represent the views of CNA or any of its sponsors. This paper is a sequel to an article published by the Armed Forces Journal on November 29, 2013.